Please forgive me for being away for so long! I FINALLY took some time this weekend to work on the SDF-1, albeit I only had time to work a very small section: the white tips of the Main Guns. This section has always bothered me; I never felt I got them completely right. 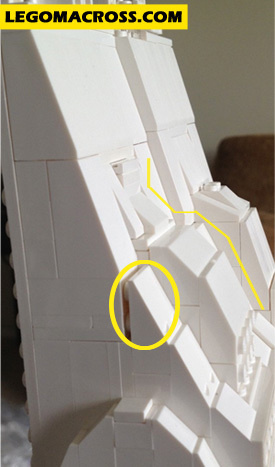 My first issue with this section is the gap in the slope, in the series of 2 x 3 slope bricks you can see one of the studs right at the transition point. This is only place on ship where a stud sticks out like this. 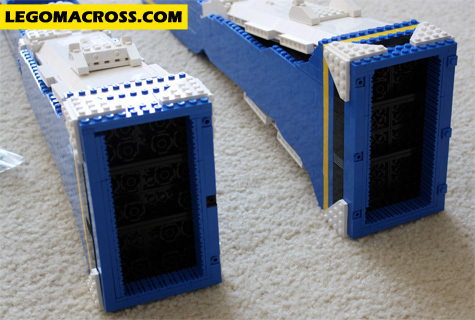 I’m no LEGO purist but I do feel that this breaks some kind of unwritten rule. Either way, it has always bothered me and I wanted to use a technique to build this slope that would not result in exposed studs. Exposed Studs on the left and the center section has 5 different angles.